The wrap account allows you to wrap all investments of your clients into one account and provides a consolidated view of all investment products such as stocks, unit trusts, ETFs and bonds. You will be able to view, monitor and manage your client's portfolio online and perform portfolio rebalancing where necessary. It makes the overall process more efficient and effective. Transfer & Consolidate: A faster way to build AUA. 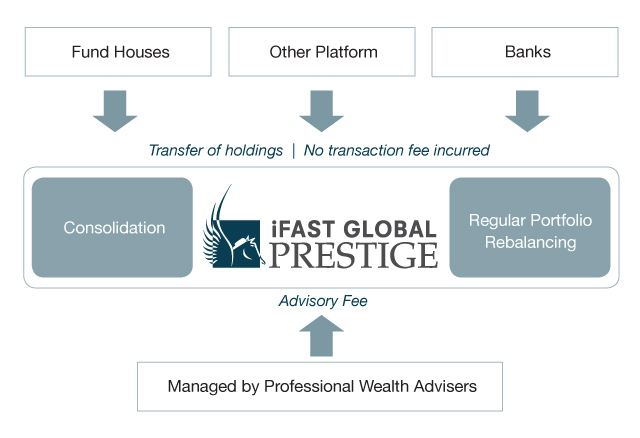 You can help your clients to consolidate all their investment holdings across different products by transferring them from different distributors or platforms into one account on the iGP platform.